I’m a huge fan of the Opels! 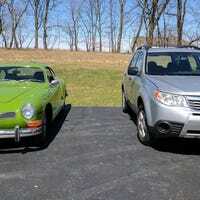 They were one of the other cars I was looking at when I bought the Ghia. Thank you! I wouldn’t trade it for anything. I’ve had the same experience with my Forester. I pride myself in my flawless hill starts, but the Subaru system seems very intelligent and it has yet to hold me in place against my will. I went on the date with one of the members a while back. Lovely girl, but I think she was a little unstable for my tastes. I’ll probably go back and drink those waters when I can find the right example for me. I’ve been seeing the light for years, just haven’t had the chance to switch! Really glad I did, though. I feel like I’m joining a cult. I’ve already got one in the mail, thanks though! I’m really counting on the low maintenance thing, it was a big reason for me ditching VW in general. That and a desperate want for some improved snownut capabilities for Michigan winters. My preference would have been an SG purely for styling reasons, but there’s really not a huge difference in driving experience based on my memory of the ‘04 FXT I drove a couple years back. They really worked some magic with the suspension on this thing, it’s incredibly well sorted. No upgrade on the suspension, just stock for stock. The GTI on the F1s would easily corner faster than the Foz on whatever it’s got, but the Scoob has a more sophisticated suspension and generally just does a really excellent job of preventing body roll. Remember, underneath that exterior it is still largely Impreza! I’ve owned two MkIVs, put fresh suspension on both, most recent one rocking Goodyear Eagle F1s. They’re just floppy cars. Well I had a 1.8 before that, I’m not a great decision maker. Considering what I started with I honestly think it’s a step up.